Like most people, if you are travelling to the “Train Market” in Mae Klong, you are wondering if you should also go to the nearby Amphawa Floating Market? The market is easily accessible from Mae Klong by Songthaew service for just 7 THB. The stand to catch a Songthaew is just a few minutes away from Mae Klong Railway Station, outside the Thanachart Bank agency. 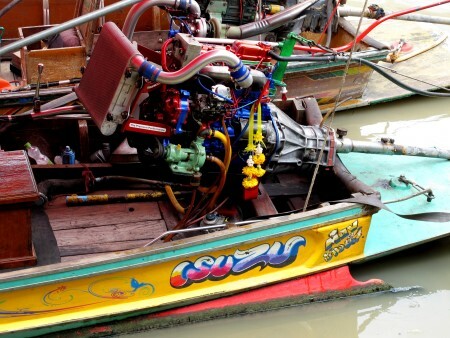 It takes just 15 minutes to reach Amphawa by Songthaew. The Floating Market is located by a temple named Wat Amphawan Chetiyaram which is used as a parking area. Note that Floating Market is only open on Friday, Saturday and Sunday from around 12.00 to 20.00. 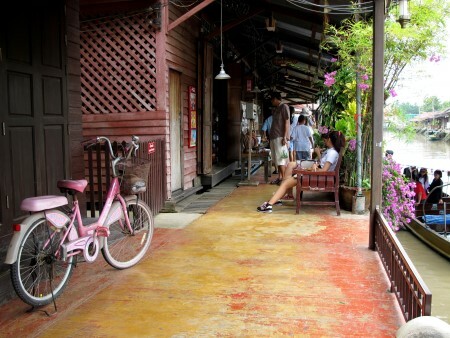 The Amphawa community received in 2008 an Honorable Mention Award from the UNESCO Asia-Pacific Heritage Awards for its efforts in preserving the local culture and architecture. It is nowadays a very popular tourist attraction for both Thai and foreign tourists, but like the “Train Market” we found that it was another Tourist trap. We do appreciate the preservation and renovation efforts made by the community but, like many places in Thailand, it has been turned into a big tourist attraction and as a consequence lacks authenticity. However, many people may disagree with our opinion, so if you still plan to go there, the market does have a few good fish and seafood restaurants for you to enjoy, as well as some nice souvenir shops. 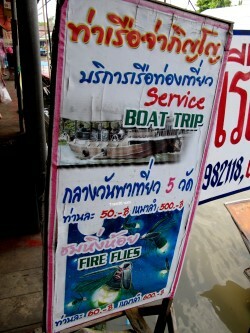 If you can stay at the market till late in the evening you will have the opportunity to rent a boat to watch fireflies swarming the trees along the river bank. 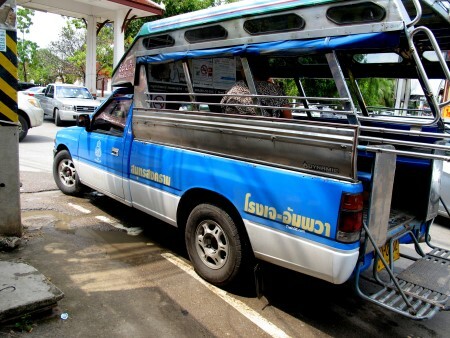 From Amphawa there are different minibus services to Victory Monument in Bangkok (80 THB / 1 h 30). There are also minibuses running in between the Southern Bus Terminal (Sai Tai Mai) and Amphawa floating market (70THB). Note that if you choose to stay late in the evening you will have to arrange your own transportation. In the end this Floating Market, which is often sold as a less touristic and more authentic market than the very touristy Damnoen Saduak Floating Market (ตลาดน้ำดำเนินสะดวก), is still a touristic place and not anymore an authentic floating market used by Thai people in their everyday life.